We were pleased to receive this great soloist for a master class and a concert. A great moment for all those who were present! David has offered his advice to a roomful of musicians and an attentive audience. Now it's time to putting into practice... For some exercises, David use the Allen Vizzuti Trumpet Method, also suitable for other brass instruments. Then he gave us three solo where he expressed his full mastery of the Euphonium. The "Grande Salle du Vieux Moulin" of Saint-Prex has opened its doors for a concert which delighted the numerous audience. David Thornton was appointed as principal euphonium of the Black Dyke Band during July 2000. 4barsrest.com, the Internet magazine commented "...it was the position he was destined for...he has made it his own with a series of concert and contest performances that have been invariably breathtaking." Born in Nottingham in 1978, David began his euphonium lessons at just eight years old and only five years later became the first ever euphonium player to gain a place at Chetham's School of Music, one of the UK's most prestigious institutions for specialist musical education. As a recording artist David has released two solo albums. His debut CD, "Three Worlds", was awarded Solo CD of the Year for 2004 by the British Bandsman magazine. In May 2007 David released his second solo album, "Devil's Duel". Furthermore, David features as a soloist on fourteen different albums with the Black Dyke Band, including "Epic Brass" and "Jubilee Brass" - live recordings of two concerts at the Royal Albert Hall. Considering David"s relatively young age, his achievements in education are also quite remarkable. He tutors at the RNCM, the University of Huddersfield and Chetham's School of Music, as well as holding visiting tutor roles at the Birmingham Conservatoire and the RSAMD. His current and former students already hold principal positions in many leading bands around the UK. 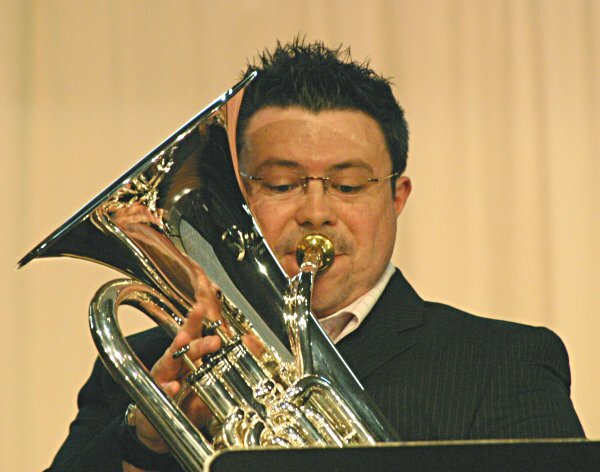 David is regarded as one of the foremost euphonium players and teachers of his generation and is in constant demand as a performer and clinician throughout the world. David Thornton plays on York Eminence Euphonium.